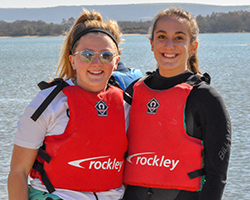 We talk to the lovely Charlotte about college life, her highlights of the last two years and her impending employement with Rockley after she graduates from the BTEC Level 3 Sport course. 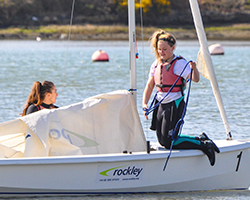 How did you find out about the Rockley BTEC L3 Sport course? It was my cousin who told me about it. I did some research and found the promo video which was really cool and I wanted to do it since then. I also came to an Open Event and had an interview and really liked it. My Dad came with me and he was really impressed with everything. Did you ever consider going down the A-Levels route? I was at QE school at the time and did look at doing my A-Levels in Biology, PE and Level 1 BTEC. My Dad really encouraged me to do the Rockley BTEC course because he knows I’m an outdoors person - A-Levels really would not have suited me. The BTEC course offers a good mix of practical and theory, although the practical is my favourite. I’ve got friends doing A-Levels at the moment and they hate it! Did you have any water experience before joining the course? Just a bit of paddleboarding really. I knew that I wanted to study by a beach and be outside a lot! At the start I hated the sailing and even on our first week in France I just didn’t like it at all but now I really love it. We do lots of other activities as well – I loved the coasteering and tunnelling – they were really fun. We’ve been for bike rides over the Purbecks as well as long walks and expeditions so a real variety of stuff. What was your first week out in France like at the very start of the course? Challenging! I barely knew anybody and then we were put in groups with people you don’t know, however it also meant that we got to know each other quicker and made friends easily as we were outside of the classroom. It probably would have taken a lot longer to get to know people if I was doing my A-Levels. It was also good to see the teachers outside of a school environment. What have been the most challenging parts of the course? Getting used to the coursework but you quickly learn that you just need to keep on top of it and it won’t be a problem. You just need to plan properly. I have a job outside of College but cut down my days from three to one in the second year so that I could really concentrate on my college work. Getting to the right standard of sailing and windsurfing has been quite difficult but the tutors have put on optional Instructor Development days on a Monday and Tuesday which a lt of us do. I really want to get my RYA Dinghy Instructor qualification before I go out to work in France in May. I already have me Windsurf Instructor. Our very first week out in France. The first few days were challenging but the whole week was great fun. Also the work experience at the end of year 1 was amazing. I was at Le Lac with Kate (Murphy, Le Lac Manager) and we were really well looked after. All the fully qualified staff were always checking that we were OK. The ski trip was also really good fun. I made so many more friends with people I hadn’t really spoken to. How has the course changed you? I’ve really grown in confidence since I first started. I used to be terrified of doing talks in front of the class - it wasn’t that I was ever shy but I would always be a lot more nervous than I am now. We do them all the time now so it feels really easy. Do you have a plan after you have graduated? My plans is to do a gap year – do a season with Rockley at Le Lac after the course and then a ski season. I’ll be going to Uni in 2020. I’ve already applied for Bath and Cardiff to do either Sport, Physical Education and Health, Sport Coaching and Management or Sport and Exercise Science. I went to Cardiff this week and I think this course (Sport Coaching and Management) really suits what I want to do. I’m really interested in the coaching side of things and the BTEC course has really set me up for this. Any advice for anyone considering the course? Throw yourself into it and just get on with it. Literally just do it. The course makes you step outside your comfort zone – you just need to get used to it and face the challenges. I think it’s a good thing. The course is definitely a lot more fun than I expected and I’m gaining lots of qualifications at the same time! 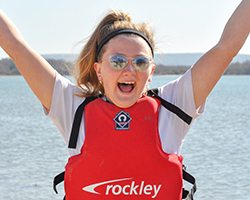 Are you looking forward to your first job with Rockley after you graduate? I didn’t think I’d be working for Rockley after the course but after the work experience in France at the end of year 1, I thought yeah and now I’m really looking forward to it. I don’t want to look anywhere else – It’s been a great two years and I know that a whole season in France using my qualifications is going to be amazing! What’s college life at Rockley like? Everyone is really good friends. The whole year get on really well with each other. At the very beginning, everyone was in their own little groups but I’d say since our work experience, you go out to France and work with people who you wouldn’t necessarily pick and you end up being best friends when you are out there. Great memories and friends for life. "She is a very motivated person with a real drive to do well and achieve the best grades she can. She’s already been to three universities to check which course is right for her. This is Charlotte all over – she makes sure she gets the right information to enable her to make the right decisions. She’s going to do well at Uni – it’s not just watersports she’s interested in – she plays other sports – football and athletics to a very high standard so she’s a great all-rounder. If she’s going down the coaching route, everything she has done during her two years will really help her and I think she’ll be great. She’s popular amongst her peers, very positive and has a lot of get up and go. She throws herself in to absolutely everything -I wish her all the luck for her future."